Scales the input signal to match a new linear output function. If the input signals value is not between the values of 'Imin' and 'Imax', the output will be linearly extrapolated. Imin: Minimum value of the input function. 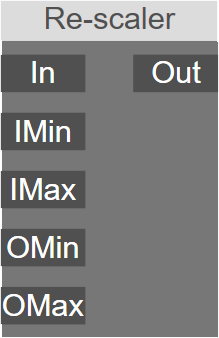 Imax: Maximum value of the input function. Omin: Minimum value of the output function. Omax: Maximum value of the output function.